Wellp, I'm throwing in the towel, I've been working on this literally all day with no joy. Weapon Control for dropping trunks: Failed. Weapons have no conditionals to use, and anything the weapon might trigger can't dynamically change. Dropping Eat Objects and having the act of eating drop the canopy: Failed. Trees cannot eat without moving. Allowing the tree to move even slightly makes the tree start galloping around the countryside. Plot Objects that drop the tree: Failed. Plot Objects do not drop creatures in the centre, but in the top left corner, somewhat bizarrely. They also didn't stop spawning, despite a one-time-effect, which spread a massive forest across the starting island, leading to a colossal forest fire from the pod wreckage that covered the whole screen. Have the tree drop a Gremlin, which hits them, and uses the Hit Block to generate the random canopy: Failed. Not only do the Gremlins not appear to register their target tree, the game CTD'd when the tree was struck, even after coding it in three different ways. So yeah, tried to be elegant, but the game Ngine wasn't having it. Now I have to start from scratch on trees and have one per canopy and I've lost the bulk of my weekend work. C'est la vie. Another day, some progress. Sorta. There's an enduring bug where trees will not terminate their associated canopy, and worse, just generate new canopies constantly with the old ones never disappearing. Since, depressingly, "is plot object near" counts *itself* as an object, there's no way to handle these duplicates (especially if the first "will not terminate" bug is active). Before this I'd briefly had the system working where four of the trees were deciduous and would spontaneously generate new foliage based on whether it was Autumn or Winter. a) Dies when the tree does. b) If it doesn't, then it kills itself if it's near Fire or a Stump or a marker left behind after a stump is collected, or failing that, it will eventually tidy itself up when the player moves outside of the screen. c) If it tidies itself away, the Tree will spawn another. If it's within a fairly generous range of its canopy, this spawn is disabled. Once I'm happy this one's working, I'll expand to cover the other evergreens and the fruit trees, then see what I can do about the others. Yes, this is a lot of work just to avoid a minor graphical glitch. Update: Niggles have been ironed out of the prototreepe, there are minor glitches if trees are overlapping, but they shouldn't really be spawning that close together anyway, since layering transparent objects means you can't even through them. Update Update: It may have taken me a week, but I've freakin' cracked it. These are dropped by the spawner randomly, and the spawner in turn turns into the tree, and sets a variable on the tree to match the Canopy Marker dropped. Whenever the tree fires, rather than dropping a specific canopy, it drops an extra plot object that then instantly transforms based on the proximity of the Canopy Marker and the season. Finally, when the tree dies, it drops a death marker. Every canopy is scripted to check for the presence of this marker and vanish if it finds it. All neat, all tidy, and functioning correctly. Now all that's left is the gruntwork in coding the rest of these god awful trees and I can finally get onto something less soul destroying. Watch this space. Wellp, I'm throwing in the towel, I've been working on this literally all day with no joy. Weapon Control for dropping trunks: Failed. Weapons have no conditionals to use, and anything the weapon might trigger can't dynamically change. Dropping Eat Objects and having the act of eating drop the canopy: Failed. Trees cannot eat without moving. Allowing the tree to move even slightly makes the tree start galloping around the countryside. Plot Objects that drop the tree: Failed. Plot Objects do not drop creatures in the centre, but in the top left corner, somewhat bizarrely. They also didn't stop spawning, despite a one-time-effect, which spread a massive forest across the starting island, leading to a colossal forest fire from the pod wreckage that covered the whole screen. Have the tree drop a Gremlin, which hits them, and uses the Hit Block to generate the random canopy: Failed. Not only do the Gremlins not appear to register their target tree, the game CTD'd when the tree was struck, even after coding it in three different ways. So yeah, tried to be elegant, but the game Ngine wasn't having it. Now I have to start from scratch on trees and have one per canopy and I've lost the bulk of my weekend work. C'est la vie. Update: Another day, some progress. Sorta. There's an enduring bug where trees will not terminate their associated canopy, and worse, just generate new canopies constantly with the old ones never disappearing. Since, depressingly, "is plot object near" counts *itself* as an object, there's no way to handle these duplicates (especially if the first "will not terminate" bug is active). Before this I'd briefly had the system working where four of the trees were deciduous and would spontaneously generate new foliage based on whether it was Autumn or Winter. So far I've scrapped everything another four times and spent another seven hours on this, but I think I've finally got a working prototype where the canopy: a) Dies when the tree does. b) If it doesn't, then it kills itself if it's near Fire or a Stump or a marker left behind after a stump is collected, or failing that, it will eventually tidy itself up when the player moves outside of the screen. c) If it tidies itself away, the Tree will spawn another. If it's within a fairly generous range of its canopy, this spawn is disabled. Once I'm happy this one's working, I'll expand to cover the other evergreens and the fruit trees, then see what I can do about the others. Yes, this is a lot of work just to avoid a minor graphical glitch. Update: Niggles have been ironed out of the prototreepe, there are minor glitches if trees are overlapping, but they shouldn't really be spawning that close together anyway, since layering transparent objects means you can't even through them. Update Update: It may have taken me a week, but I've freakin' cracked it. 9 Canopy Markers. These are dropped by the spawner randomly, and the spawner in turn turns into the tree, and sets a variable on the tree to match the Canopy Marker dropped. Whenever the tree fires, rather than dropping a specific canopy, it drops an extra plot object that then instantly transforms based on the proximity of the Canopy Marker and the season. Finally, when the tree dies, it drops a death marker. Every canopy is scripted to check for the presence of this marker and vanish if it finds it. All neat, all tidy, and functioning correctly. Now all that's left is the gruntwork in coding the rest of these god awful trees and I can finally get onto something less soul destroying. Watch this space. Every one of those trees has a trunk, can be harvested, disappears correctly when the trunk is harvested, and works properly. Shortly after this screenshot, I grabbed that Plasma Spray and burned them all down. Onto spawning them! Update: [img]http://fc02.deviantart.net/fs70/f/2012/090/2/5/letting_off_some_steam__by_horizonedge-d4uj88s.jpg[/img] Every one of those trees has a trunk, can be harvested, disappears correctly when the trunk is harvested, and works properly. Shortly after this screenshot, I grabbed that Plasma Spray and burned them all down. Onto spawning them! "I'm not driven to win, I'm too stubborn to lose." Right now however, I am taking a very easy weekend playing Hidden Dimensions. That really took it out of me. Glad to have another tester on board Yin^2, best of luck finding a mouse, I look forward to your feedback. Hm. I believe the best way to describe it would be: "I'm not driven to win, I'm too stubborn to lose." Right now however, I am taking a very easy weekend playing [url=http://www.kongregate.com/games/nulllvoid/hd-spectrum]Hidden Dimensions[/url]. That really took it out of me. Glad to have another tester on board Yin^2, best of luck finding a mouse, I look forward to your feedback. I played on easy mode ._. There is nothing i could defeat through punching. I quickly figured out that I have to defend myself with anything I can get my hands on. But why does every monster on the first screen need to rush for me (through water) until I am dead (or them ...)? Well after I managed to diminish them they started to turn into cowards which is a funny feature. But also frustrating when you are starving and can't find enough fungi. Disabling certain weapon groups is a really nice feature, but it does not always work. At first when I only had wood, metal, rocks and claws to defend myself with I tried the never unarmed option. I still stood unarmed every now and then. This would be a lot more pleasant if it would also auto select a weapon for you depending on your conditions. For example I often became unarmed when entering water because I was carrying something two handed. It would be great if it could auto select the next one handed weapon that is not disallowed and also switch back to the previous one when coming out of the water. If that is even possible. So I started looting ship wrecks. Became overburdened pretty fast. At some point during this journey I noticed that some food and health items don't work with the hot keys. And one type of food (that didn't work with the hot key) also refilled me but did not disappear. I will recheck what that was. What really confused me towards the end was that the ion storm in the ship graveyard started to disable any kind of weapon I had. I cannot remember this happening at the start but it made it impossible to explore it any further. the android gives me a much better start. I can punch about anything to death. I can carry more and even expand capacity with servos. But then again I don't need most of the junk lying around like the human does. Without ingenuity I had a hard time making myself a proper weapon. I could live pretty long from blue herbs and charging batteries with electric sacs. But I did not manage becoming self sufficient in any way. At some point the herbs and brown aliens seemed to run out and my once 300 energy points dropped to zero. Just when I had finally made myself a force pistol (first gun I actually wanted to use because of it's seemingly low energy consumption). First run I had bullets and a pistol chassis but no powered accelerator. Second run I had a functioning Pistol (gauss) but no bullets. Also a shotgun, but I somehow never found any pellets with the android (am I filtering all organic/natural resources too well?). So with the human life was much harder but I think I can survive for as long as I need. The android is easier but I run out of energy at some point (I did find a solar panel on the first run but I had nothing to connect to it). I found a mouse and then I started dying like a human does small blue aliens killed me medium brown aliens killed me bee venom killed me (fleeing into water didn't help) reapers killed me (only the big ones tho) only green aliens never killed me I played on easy mode ._. There is nothing i could defeat through punching. I quickly figured out that I have to defend myself with anything I can get my hands on. But why does every monster on the first screen need to rush for me (through water) until I am dead (or them ...)? Well after I managed to diminish them they started to turn into cowards which is a funny feature. But also frustrating when you are starving and can't find enough fungi. Disabling certain weapon groups is a really nice feature, but it does not always work. At first when I only had wood, metal, rocks and claws to defend myself with I tried the never unarmed option. I still stood unarmed every now and then. This would be a lot more pleasant if it would also auto select a weapon for you depending on your conditions. For example I often became unarmed when entering water because I was carrying something two handed. It would be great if it could auto select the next one handed weapon that is not disallowed and also switch back to the previous one when coming out of the water. If that is even possible. So I started looting ship wrecks. Became overburdened pretty fast. At some point during this journey I noticed that some food and health items don't work with the hot keys. And one type of food (that didn't work with the hot key) also refilled me but did not disappear. I will recheck what that was. I badly wish for a flashlight from the start. I did find one, but then I broke it up to turn it into a pulse laser. I also created myself all kinds of guns (but had no ammunition) and a pulse beacon (but again no ammo). So I had to stay with pulse laser, double barrel shotgun and bows ... these are very hard to use. It would be great to have enemies get thrown a bit farther back when being hit by an arrow - or maybe I just cannot aim with them. (But even the targeting laser didn't help me much with the bows) What really confused me towards the end was that the ion storm in the ship graveyard started to disable any kind of weapon I had. I cannot remember this happening at the start but it made it impossible to explore it any further. oh and I did cut down some trees obviously - looking forward to the next version of them and I had one fun time with that yellow flower OMG IM DEAD -no im not -OMG IM BRUNIN -no im not edit: the android gives me a much better start. I can punch about anything to death. I can carry more and even expand capacity with servos. But then again I don't need most of the junk lying around like the human does. Without ingenuity I had a hard time making myself a proper weapon. I could live pretty long from blue herbs and charging batteries with electric sacs. But I did not manage becoming self sufficient in any way. At some point the herbs and brown aliens seemed to run out and my once 300 energy points dropped to zero. Just when I had finally made myself a force pistol (first gun I actually wanted to use because of it's seemingly low energy consumption). First run I had bullets and a pistol chassis but no powered accelerator. Second run I had a functioning Pistol (gauss) but no bullets. Also a shotgun, but I somehow never found any pellets with the android (am I filtering all organic/natural resources too well?). So with the human life was much harder but I think I can survive for as long as I need. The android is easier but I run out of energy at some point (I did find a solar panel on the first run but I had nothing to connect to it). Ahh, lovely. Thanks for this. It's nice to get a perspective from someone who hasn't practised the thing so much that they can punch their way through big blue aliens. Sorry in advance for the rambling. Why do the first aliens rush you? Good question. This is hinted at in the opening text if I recall - you've just crashed, rather spectacularly. There's a blazing fire nearby. The local alien population is coming to investigate, and if they see you - at all, then they'll attack you until you drive them away or kill them. If you leave the island as quickly as possible and avoid them, then you'll be less of a target, since they'll be more likely to investigate the island than roam around hunting for you. * There's actually a major advantage for you on the island. You'll need to break the wood anyway for one of your most important survival tools, so it's no loss to use it smacking small aliens. Two hits should kill a small blue alien, so with two sticks next to your starting point you'll be able to weaken or take out most, if not all of your attackers, and the stick has a lot of knockback to keep you safe. * There's one guaranteed set of Scrap Metal in the Lake area. With Kindling and Scrap Metal, you have a knife, a major, major upgrade over your punch (the knife deals multiple hits against targets and has better damage anyway), something that can kill most aliens without taking too much punishment in return. * Tools give a bonus to all the loot you get from wrecks. If you want to be as clever as possible, break one stick, save the other. Use your new knife to carve yourself some wood. Break the knife back into scrap, use the wood to make tools, and only *then* scavenge your escape pod. If you get spare scrap metal, you can use it to make a new knife and keep the tools for any future wrecks you come across. * The other tool with a bonus is the welding torch. With this and tools in your inventory (and an even bigger bonus if you're the android and your cutting torch is available), you'll get better loot. * You can't get the best loot without having the right tools available, so if you come across a major wreck (large freighter, battleship etc, you'll be able to discern some value from the wreck's description), you might want to save it in order to get more, better, stuff by using all the tools available. * I think you might have missed out on them, but don't underestimate melee weapons. With claws, you can make a knife, with claws and metal, you can make a sword. Maybe not as elegant as having a sword of metal alone, but it's still one of the best early game weapons. With your tools and some kindling, you could make yourself a spear, which is a dead-end weapon, but very much capable of wrecking some alien face. * You might be sad to hear this, but you were seriously close to making something awesome with that Pulse Beacon. A Vibrosword can kill almost any alien (melee alien that is) and uses no ammo. It's one of the best possible weapons in the game. * The bow and arrow doesn't have the best knockback, but it does pretty decent damage (you may want to stick to using it against larger aliens though, for several reasons). If you had some bullets, metal arrows cause bleeding and deal more damage and knockback than wooden ones. Explosive arrows or fire arrows will tear through aliens pretty quick too. Remember that the weapon is almost silent, this is not a small advantage. The captain can also upgrade the bow pretty easily to give it more "oomph". * If you fight enough unarmed, the human will improve. It's better to practice your kata on something that won't "practice" back however. A fully upgraded punch will take a lot of practice, but if you have time and food to kill, may as well? * Cook. For the love of god, cook. Cooked food often weighs less, restores more, and if you manage to prepare it, a few helpings of slow release energy should keep you well fed for days. You should probably cook all your food if you can manage it. If you can find it, I'd love to know which foodstuff sticks around permanently, sounds like yet another bug. * Store your gear somewhere. You noticed this pretty quick, being overloaded will massively increase your fatigue/food/thirst/energy drain. - Adult Reapers are blind, they are not deaf. * Make, and use, armour. Scrap metal and a blue alien should set you up with an awesome set-up for most of the early game. Scrap alone for the android is vital (and why he needs such a large carrying capacity). Pebbles are fairly rare right now - this is sorta intentional. You're in a jungle, stones are uncommon. As stonier areas (or sandier ones) show up more, pebbles will be way more common. Tzo Crystals are actually pretty common overall, since they show up in ice packs (freighters carry those as well as raw Tzo) and are plenty useful. Eventually there may be a renewable source of them, same with ether. The same with bullets - you aren't going to find many just scattered around (you may, but they're non-renewable), but you will find quite a few when you start taking out gun turrets or marines. Why was the pulse laser hard to use? It's very accurate last I recall, though not very good against organics. The bow and sling are a lot trickier, but the shottie is great at short ranges, and I think with claws equipped it becomes pretty lethal. Did you try using the regular laser pistol? "Unarmed Safety" means that you shouldn't use your Punch or Knife (unarmed type weapons), rather than you will never be unarmed. It will always override this if you have no other melee weapons however, to keep you from being stuck without a paddle. Glad you like the Yellows. In time hopefully I'll be able to add more "animations" (like the game over screen) to make your trips a little less "dark". You can actually get some use out of them if you're lucky too (I use them as helpful hypothermia cures, hot flushes and hyperactivity are almost instant cures if you're lucky enough to get 'em together). I believe servos improve more than just carrying capacity, they should also increase the android's "strength". This is pure bonus damage for melee weapons, so don't ignore it. Same with the targetting laser, +2 damage per shot is pretty neat. Android: Thank you. That is 100% what I was going for. The android is more powerful than the human, but they are not sustainable in a zero technological environment. They will get some more goodies (their cutting torch will get upgrades either this or next version), and ether-burning generators will help restore their power, but they will never have the ability of the human to subsist so easily. a) Run a check when you have a weapon unequipped in the water and add a corresponding marker to reequip it whenever you no longer have the "swimming" token. I'll dovetail this into fixing the options menu to automatically reequip you (something that will involve so much work it's not even funny), so this will be very much end-game material. I may add a conditional for swimming that checks you're not holding any other one handed melee weapon if swimming, or a bow/sling if E.I'd. It's another long term one, but remind me if it's not in the next few versions. Ahh, lovely. Thanks for this. It's nice to get a perspective from someone who hasn't practised the thing so much that they can punch their way through big blue aliens. Sorry in advance for the rambling. [b]Tips:[/b] [i]Why do the first aliens rush you? [/i] Good question. This is hinted at in the opening text if I recall - you've just crashed, rather spectacularly. There's a blazing fire nearby. The local alien population is coming to investigate, and if they see you - at all, then they'll attack you until you drive them away or kill them. If you leave the island as quickly as possible and avoid them, then you'll be less of a target, since they'll be more likely to investigate the island than roam around hunting for you. * There's actually a major advantage for you on the island. You'll need to break the wood anyway for one of your most important survival tools, so it's no loss to use it smacking small aliens. Two hits should kill a small blue alien, so with two sticks next to your starting point you'll be able to weaken or take out most, if not all of your attackers, and the stick has a lot of knockback to keep you safe. * There's one guaranteed set of Scrap Metal in the Lake area. With Kindling and Scrap Metal, you have a knife, a major, major upgrade over your punch (the knife deals multiple hits against targets and has better damage anyway), something that can kill most aliens without taking too much punishment in return. * Tools give a bonus to all the loot you get from wrecks. If you want to be as clever as possible, break one stick, save the other. Use your new knife to carve yourself some wood. Break the knife back into scrap, use the wood to make tools, and only *then* scavenge your escape pod. If you get spare scrap metal, you can use it to make a new knife and keep the tools for any future wrecks you come across. * The other tool with a bonus is the welding torch. With this and tools in your inventory (and an even bigger bonus if you're the android and your cutting torch is available), you'll get better loot. * You can't get the best loot without having the right tools available, so if you come across a major wreck (large freighter, battleship etc, you'll be able to discern some value from the wreck's description), you might want to save it in order to get more, better, stuff by using all the tools available. * I think you might have missed out on them, but don't underestimate melee weapons. With claws, you can make a knife, with claws and metal, you can make a sword. Maybe not as elegant as having a sword of metal alone, but it's still one of the best early game weapons. With your tools and some kindling, you could make yourself a spear, which is a dead-end weapon, but very much capable of wrecking some alien face. * You might be sad to hear this, but you were seriously close to making something awesome with that Pulse Beacon. A Vibrosword can kill almost any alien (melee alien that is) and uses no ammo. It's one of the best possible weapons in the game. * The bow and arrow doesn't have the best knockback, but it does pretty decent damage (you may want to stick to using it against larger aliens though, for several reasons). If you had some bullets, metal arrows cause bleeding and deal more damage and knockback than wooden ones. Explosive arrows or fire arrows will tear through aliens pretty quick too. Remember that the weapon is almost silent, this is not a small advantage. The captain can also upgrade the bow pretty easily to give it more "oomph". * If you fight enough unarmed, the human will improve. It's better to practice your kata on something that won't "practice" back however. A fully upgraded punch will take a lot of practice, but if you have time and food to kill, may as well? * Cook. For the love of god, cook. Cooked food often weighs less, restores more, and if you manage to prepare it, a few helpings of slow release energy should keep you well fed for [i]days[/i]. You should probably cook all your food if you can manage it. If you can find it, I'd love to know which foodstuff sticks around permanently, sounds like yet another bug. * Store your gear somewhere. You noticed this pretty quick, being overloaded will massively increase your fatigue/food/thirst/energy drain. * The Ship Graveyard is definitely not an early game location, it's full of Reapers, the rain drains your energy and both can (and does) disable any and every weapon with an electrical component. There are maybe three weapons with electrical components that function within an electrical storm or stasis field. Note that this doesn't apply to non-electrical weapons, such as the welding torch, the sword, the bow or the spear. If you can't beat Reapers with melee weapons, then remember one very, very important fact: - Adult Reapers are blind, they are not deaf. * Make, and use, armour. Scrap metal and a blue alien should set you up with an awesome set-up for most of the early game. Scrap alone for the android is vital (and why he needs such a large carrying capacity). Note: Pebbles are fairly rare right now - this is sorta intentional. You're in a jungle, stones are uncommon. As stonier areas (or sandier ones) show up more, pebbles will be way more common. Tzo Crystals are actually pretty common overall, since they show up in ice packs (freighters carry those as well as raw Tzo) and are plenty useful. Eventually there may be a renewable source of them, same with ether. The same with bullets - you aren't going to find many just scattered around (you may, but they're non-renewable), but you will find quite a few when you start taking out gun turrets or marines. Why was the pulse laser hard to use? It's very accurate last I recall, though not very good against organics. The bow and sling are a lot trickier, but the shottie is great at short ranges, and I think with claws equipped it becomes pretty lethal. Did you try using the regular laser pistol? "Unarmed Safety" means that you shouldn't use your Punch or Knife (unarmed type weapons), rather than you will never be unarmed. It will always override this if you have no other melee weapons however, to keep you from being stuck without a paddle. Glad you like the Yellows. In time hopefully I'll be able to add more "animations" (like the game over screen) to make your trips a little less "dark". ;) You can actually get some use out of them if you're lucky too (I use them as helpful hypothermia cures, hot flushes and hyperactivity are almost instant cures if you're lucky enough to get 'em together). I believe servos improve more than just carrying capacity, they should also increase the android's "strength". This is pure bonus damage for melee weapons, so don't ignore it. Same with the targetting laser, +2 damage per shot is pretty neat. Android: Thank you. That is 100% what I was going for. The android is more powerful than the human, but they are not sustainable in a zero technological environment. They will get some more goodies (their cutting torch will get upgrades either this or next version), and ether-burning generators will help restore their power, but they will never have the ability of the human to subsist so easily. I like your idea of Stored weapons. I may add in the future an "auto-reequip" and "auto-melee" option to the options menu, these will add markers that will: a) Run a check when you have a weapon unequipped in the water and add a corresponding marker to reequip it whenever you no longer have the "swimming" token. I'll dovetail this into fixing the options menu to automatically reequip you (something that will involve so much work it's not even funny), so this will be very much end-game material. b) Run a check whenever you receive an E.I or Swimming token and equip a melee item accordingly. This won't override your safeties, I may add a conditional for swimming that checks you're not holding any other one handed melee weapon if swimming, or a bow/sling if E.I'd. It's another long term one, but remind me if it's not in the next few versions. great I will try fleeing the island right away next time. I did notice the scrap metal in a little crater southwest. And I also did create myself a claw sword, katana spear and all that. But I have to admit I'm not that good with melee weapons. Especially not against grown Reapers, but maybe their bad sight will help me next time. Maybe you should write the looting bonus into the tools description - because I disregarded them as useless - I had nothing to repair and everything else could also be done with a knife which doubled as a weapon. About cooking - I already did cut up everything edible I could but I did not try anything with fire yet. Now that I do: blue alien meat cannot be cooked right? and the pears don't disappear when I eat them. what electrical component is there in a shotgun - or normal gun? because the ion storm disabled them. the pulse laser was a fine weapon - I only had problems with the bows (all three I had). can't wait for some desert area with robots for the android to survive. may as well shoot bees! no thank you. punching had no visible effect on anything at all. Maybe a pathetic sound when punching trees. great I will try fleeing the island right away next time. I did notice the scrap metal in a little crater southwest. And I also did create myself a claw sword, katana spear and all that. But I have to admit I'm not that good with melee weapons. Especially not against grown Reapers, but maybe their bad sight will help me next time. Maybe you should write the looting bonus into the tools description - because I disregarded them as useless - I had nothing to repair and everything else could also be done with a knife which doubled as a weapon. About cooking - I already did cut up everything edible I could but I did not try anything with fire yet. Now that I do: blue alien meat cannot be cooked right? and the pears don't disappear when I eat them. what electrical component is there in a shotgun - or normal gun? because the ion storm disabled them. the pulse laser was a fine weapon - I only had problems with the bows (all three I had). can't wait for some desert area with robots for the android to survive. [quote=postid_395004]may as well? [/quote]may as well shoot bees! no thank you. punching had no visible effect on anything at all. Maybe a pathetic sound when punching trees. I've been watching this thread for some time now. You tnn17 have done great work for this mod. You really have put some effort in making this. Keep up the good work. Though I dislike your graphical style. It differs too much from the original style. while it has some original item pictures mutilated to something else. IMO you should follow the original style when adding new stuff. For example why there is a escape pod connected to the flamer? Or you could redraw almost everything. Have to say that your character ragdols are too much anime! As I am still longing for notrium 3d, I had some ideas to improve the 2d game. Some these ideas are possible to do by modding. while other are for Ville if he is making an update for notrium. Since some of these require changes in the game-engine. -Trees could have shadows! A semi transparent sprite to indicate the drop shadow. It could be scaled vertically to indicate angle of the sun. And it could be turned around the source object as time changes. It could be used to other objects as well. for example hooverbot's (ehm i mean those desert robots) drop shadow should have offset, illustrating that it really floats. Of course this offset (and direction) would vary depending by the position of the sun. I mean by the time. Other character's shadows would be much complicated. I'd use dropshadow with very soft edge for those. Okay it would not loot so realistic, since sun is a point like light source. But Animating would require much more work. Shadows would give nice 3d-ish feel and improve feel of time passing by. No heavy ray tracing, shaders or other fancy coding required. Just sprites that are manipulated by ingame time! -Time of day should change more smoothly. Now day turns to nigth in ten seconds or something. -Color temperature should be matched to day cycle too! Do i need to say more? -Ligths at nigth time would be nice if the shadow would done using umbra and penumbra correctly. Although this reguires some shaders, am i rigth? -Higher resolution everything! Especially items. I'd like to draw sprites for a notrium mod, but 64x64pixels just kills the inspiration. I understand that the game-engine propably wont allow to modify this. I really like the gadgets that exist in the original game, even though they are too small. Atleast inventory item description panel should have bigger image of selected item. I could even do some nice little renderings for those pictures. Which brings me to another point. -Must say that inventory could be bigger. For bigger description panel. Also it would be easier to play on big screen. Or inventory could be scalable. -Dreamscapes are too lame! Graphically dreamscapes should be extremely trippy. Gameplay in dreamscapes should be completely different too. Every dreamscape should be different from others. Maybe some puzzle games with no player character? Maybe slight 3d stuff? a very low-fi 3d platformer? Maybe just some random 5 minute demo? Yeah, I know the game-engine is the limit here. Just saying, maybe this idea is to be used in next version of notrium or something. -Start of the game where player have steer the escape pod to crash the planet looks rather poor! Mostly because the background doesn't look too good. It has too thick pattern and its too blue. As the sources of wazzal are released, would it be possible to implement a wazzal like stardust effect to notrium start? Background should be static or move very little. And those little dots should make feel of movement. This may require help from Ville or someone else to mess with the sources. Not sure if the mod-editor allows to do this. Maybe if each dot would be one creature. And those move when player presses a key. -The notrium planet at start should be much bigger! It would look cool if the planet doesn't fit the screen. About 1/4 of it to be visible when pod touches it. This on should be easy one. Remember to use higher resolution picture, do not just scale the original! -The notrium planet at start could be like in those in wazzal! Requires 3d or just nice animating. What do you think? Feel free to use these ideas in your mod. PS. If you need help with graphical stuff i might be able to help you out. I've been watching this thread for some time now. You tnn17 have done great work for this mod. You really have put some effort in making this. Keep up the good work. Though I dislike your graphical style. It differs too much from the original style. while it has some original item pictures mutilated to something else. IMO you should follow the original style when adding new stuff. For example why there is a escape pod connected to the flamer? Or you could redraw almost everything. Have to say that your character ragdols are too much anime! As I am still longing for notrium 3d, I had some ideas to improve the 2d game. Some these ideas are possible to do by modding. while other are for Ville if he is making an update for notrium. Since some of these require changes in the game-engine. -Trees could have shadows! A semi transparent sprite to indicate the drop shadow. It could be scaled vertically to indicate angle of the sun. And it could be turned around the source object as time changes. It could be used to other objects as well. for example hooverbot's (ehm i mean those desert robots) drop shadow should have offset, illustrating that it really floats. Of course this offset (and direction) would vary depending by the position of the sun. I mean by the time. Other character's shadows would be much complicated. I'd use dropshadow with very soft edge for those. Okay it would not loot so realistic, since sun is a point like light source. But Animating would require much more work. Shadows would give nice 3d-ish feel and improve feel of time passing by. No heavy ray tracing, shaders or other fancy coding required. Just sprites that are manipulated by ingame time! -Time of day should change more smoothly. Now day turns to nigth in ten seconds or something. -Color temperature should be matched to day cycle too! Do i need to say more? -Ligths at nigth time would be nice if the shadow would done using umbra and penumbra correctly. Although this reguires some shaders, am i rigth? -Higher resolution everything! Especially items. I'd like to draw sprites for a notrium mod, but 64x64pixels just kills the inspiration. I understand that the game-engine propably wont allow to modify this. I really like the gadgets that exist in the original game, even though they are too small. Atleast inventory item description panel should have bigger image of selected item. I could even do some nice little renderings for those pictures. Which brings me to another point. -Must say that inventory could be bigger. For bigger description panel. Also it would be easier to play on big screen. Or inventory could be scalable. -Dreamscapes are too lame! Graphically dreamscapes should be extremely trippy. Gameplay in dreamscapes should be completely different too. Every dreamscape should be different from others. Maybe some puzzle games with no player character? Maybe slight 3d stuff? a very low-fi 3d platformer? Maybe just some random 5 minute demo? Yeah, I know the game-engine is the limit here. Just saying, maybe this idea is to be used in next version of notrium or something. -Start of the game where player have steer the escape pod to crash the planet looks rather poor! Mostly because the background doesn't look too good. It has too thick pattern and its too blue. As the sources of wazzal are released, would it be possible to implement a wazzal like stardust effect to notrium start? Background should be static or move very little. And those little dots should make feel of movement. This may require help from Ville or someone else to mess with the sources. Not sure if the mod-editor allows to do this. Maybe if each dot would be one creature. And those move when player presses a key. -The notrium planet at start should be much bigger! It would look cool if the planet doesn't fit the screen. About 1/4 of it to be visible when pod touches it. This on should be easy one. Remember to use higher resolution picture, do not just scale the original! -The notrium planet at start could be like in those in wazzal! Requires 3d or just nice animating. What do you think? Feel free to use these ideas in your mod. PS. If you need help with graphical stuff i might be able to help you out. A whole lot of that requires changes to the Notrium engine, which is just not going to happen (if I recall correctly Ville said he doesnt remember much of the source code anymore which is perfectly reasonable for, what, a decade old game, and besides he is working on the Driftmoon engine instead). Youd probably have more luck just making a Driftmoon mod instead. Nice idea, I've added a line to the short description. When I do the descriptions proper (which will include longer journal entries) then it may get shifted over there. Which pear, if I may? I'm checking the code and they're all set to disappear correctly. Blue Alien meat can indeed be cooked, but some food has to be boiled, not roasted. Particle Accelerators. Remember that these aren't chemical propellants, you're using a battery to propel projectiles. Whilst desert areas aren't due imminently, there should be a few extra ways to generate energy that may make things easier for Android fans. may as well shoot bees! no thank you. punching had no visible effect on anything at all. Maybe a pathetic sound when punching trees. I always shoot bees. Twenty hits will kill a swarm, far fewer with a knife or blade. Or you could set them on fire. Punching a tree wouldn't be bad. You deal 5 damage per punch at punch level 1 (three-four punches would kill a small blue alien, it will probably run away). At level 2, you deal 7. Three punches will kill a small blue, and it will rarely run before you finish killing it. At level 3, you deal 9 and have a longer range and more knockback than the knife, making it easier to stay out of range whilst four-shotting small brown aliens. Prefic: Graphical help would be appreciated, thanks. Since I gotta get to work I'll add another post on my lunch break to respond to most of your post in detail. As a good start however, and in keeping with your desires for more resolution - what about a double size 512 x 512 sprite sheet for the Captain, Android, Extropian (cybernetic non-symmetrical humanoid with a hat or hood), and the S.O. (female armoured humanoid, includes a psionic attack animation of some description)? These would require a generic melee animation that suits swords and clubs, a bow firing animation, guns, possibly a different animation for "cannister" gun weapons that include a "backpack" for the Flamer/Extinguisher etc, and thrown weapons. These four would all be fairly similar to one another outside of cosmetic and size differences. Don't feel obligated to fill the entire space shoulder to shoulder, or stick with the front-facing torso, especially for bows, melee and the like. I'm hoping that 512 x 512 gives enough space to get some full animations in there. The "escape pod" is actually the storage container, check container.png. It's present on the Flamer because the storage container is part of the container. The container is metal, not glass, hence the variance. All the ragdolls are "anime"? That's curious, the first Extropian ragdoll was, definitely, but none of the others had much, if any, anime roots. Any features in particular? [quote=postid_398005]Maybe you should write the looting bonus into the tools description - because I disregarded them as useless - I had nothing to repair and everything else could also be done with a knife which doubled as a weapon. [/quote] Nice idea, I've added a line to the short description. When I do the descriptions proper (which will include longer journal entries) then it may get shifted over there. Which pear, if I may? I'm checking the code and they're all set to disappear correctly. Blue Alien meat can indeed be cooked, but some food has to be boiled, not roasted. [quote]what electrical component is there in a shotgun - or normal gun? because the ion storm disabled them. the pulse laser was a fine weapon - I only had problems with the bows (all three I had). [/quote] Particle Accelerators. Remember that these aren't chemical propellants, you're using a battery to propel projectiles. Whilst desert areas aren't due imminently, there should be a few extra ways to generate energy that may make things easier for Android fans. [quote=postid_395004]may as well shoot bees! no thank you. punching had no visible effect on anything at all. Maybe a pathetic sound when punching trees. [/quote] I always shoot bees. Twenty hits will kill a swarm, far fewer with a knife or blade. Or you could set them on fire. Punching a tree wouldn't be bad. You deal 5 damage per punch at punch level 1 (three-four punches would kill a small blue alien, it will probably run away). At level 2, you deal 7. Three punches will kill a small blue, and it will rarely run before you finish killing it. At level 3, you deal 9 and have a longer range and more knockback than the knife, making it easier to stay out of range whilst four-shotting small brown aliens. [b]Prefic[/b]: Graphical help would be appreciated, thanks. Since I gotta get to work I'll add another post on my lunch break to respond to most of your post in detail. As a good start however, and in keeping with your desires for more resolution - what about a double size 512 x 512 sprite sheet for the Captain, Android, Extropian (cybernetic non-symmetrical humanoid with a hat or hood), and the S.O. (female armoured humanoid, includes a psionic attack animation of some description)? These would require a generic melee animation that suits swords and clubs, a bow firing animation, guns, possibly a different animation for "cannister" gun weapons that include a "backpack" for the Flamer/Extinguisher etc, and thrown weapons. These four would all be fairly similar to one another outside of cosmetic and size differences. Don't feel obligated to fill the entire space shoulder to shoulder, or stick with the front-facing torso, especially for bows, melee and the like. I'm hoping that 512 x 512 gives enough space to get some full animations in there. A few points that stuck out: The "escape pod" is actually the storage container, check container.png. It's present on the Flamer because the storage container is part of the container. The container is metal, not glass, hence the variance. All the ragdolls are "anime"? That's curious, the first Extropian ragdoll was, definitely, but none of the others had much, if any, anime roots. Any features in particular? As promised, a more detailed response. Note that I actually rather like Notrium's art style and consider graphics to be absolutely the least important aspect of a game (I grew up playing Hack, this might also reveal my love of absurd difficulty and trial and error gameplay...), but I will be going in depth into some of the flaws in the original style. I've been watching this thread for some time now. You tnn17 have done great work for this mod. You really have put some effort in making this. Keep up the good work. - Thanks! Though I dislike your graphical style. - This is fair, I don't pretend to be a dedicated artist, and let's face it, top-down is hard to do and hard to lift from other sources. It differs too much from the original style. - Now this, this I don't agree with. The original style, nostalgia aside, has some aspects that simply constrain a mod's artistic freedom if you wanted to stick with them. - Curvy Handled Pistols. I've lost count of the number of mods that have every single gun have an utterly unusable grip because they're constrained to the original pistol. - (IMBWB) A lot of the graphics are created in 3d-imaging software. Without the nostalgia filter, it's pretty easy to spot the internal inconsistency that was already present in Notrium. Compare the laser pistol with the fire extinguisher. There are at least two tiers of graphics which are very different to one another. - The monochrome sprites - The Captain is no longer entirely green. I stand by this change as a pure improvement. - Magical parts. Where does the major component that makes a laser pistol a pistol come from? Where does the metal tip of a welding torch come from? The "pod" in the flamer is a metal cannister that is part of its construction and an item in its own right, it is present in the design for a reason. - Many of the items that aren't manufacturable in Notrium Default are in FM, so the parts to make it need to play a role in its design. Red Plants weren't gatherable, so a non-top down, detailed image of the plant is necessary... So some things simply needed to be changed or added to. - An electrically unfeasible energy coupling. This essentially completes a circuit between one end of the coupling and the other, with no external connection for integration into a power supply or device. That and they're totally a pair of earmuffs. This isn't the only example of something that looks a little wonky in this manner. Better, as you say, to shift over to a new style that's also consistent than to remain with what was already there. Plasma weapons are an example - all of them contain the components of their construction, all of them have the same overall "theme" to their design. All the pistols share the pistol chassis in common. That sort of design consistency spread to all things would be awesome by me. Have to say that your character ragdols are too much anime! - Apart from not being sure what you consider to be anime, I'm fairly sure I prefer the new ragdolls over the old. Have you looked at the old ragdolls of late? They're inconsistent with one another (Psionic), and they're barely detailed (Android), or they're excessively detailed (Notrium aliens get the most love). So this is completely with the goal of creating a consistent Ragdoll theme: If I bring the android up to a more detailed, imposing image, and the psionic with it, then the Captain suddenly looks pretty bland too. They all needed a facelift. Trees could have shadows! - Engine limitation. One cannot have a plot object drop in a specific location. The game engine doesn't account for how far into the light oscillation you are either, so the game inherently has no way of keeping track of the time of day. This said, one could do something if they were using my code for a Script Based Day-Night system and ran a little versatile with images. First, they'd need a shadow picture. This would be plot object Shadow 1. This would be a circle (fuzzy border) of near-transparent black situated to the right of the image ([ o]). This would be the dawn shadow. Shadow 2: The Noon shadow ([ o ]), and Shadow 3, the Dusk Shadow ([o ]). Each has a lifespan of 1 ms.
Every 1 ms, the shadow dropping entity would drop a shadow of the appropriate type, depending on the time of day. Each entity would need its own distinct code, to drop a shadow plot object that was appropriately sized to match the dropping entity. Any non-periodic plot object would require a duplicate plot object to be created (and dynamically destroyed) alongside it in order to handle the shading. Whilst possible, this is low on my list of possible additions, I don't see it adding much to the game for the amount of work involved, or for the load on a computer that a thousand additional scripts running per second, per entity, entails. Time of day should change more smoothly. Now day turns to nigth in ten seconds or something. - Planned. When I move onto the new script-based system, day to night will occur over the course of several in-game hours. Color temperature should be matched to day cycle too! Do i need to say more? - Yes please. I am unaware of any colour outside of Bars, which have unchangeable colour schemes. Is this what you're referring to? Lights at night time would be nice if the shadow would done using umbra and penumbra correctly. Although this reguires some shaders, am i right? - I'm not sure what you are saying, however light sources never produce shadows in the Notrium engine, and have distinct properties that cannot be readily altered. Higher resolution everything! - Whilst the Notrium engine can and does handle larger images (all images from the V'E ship to the humble Bullet stick to the same 8x8 multiple rule and are stretched or shrunk accordingly), this is a question of system resources versus necessity. A 1024 x 1024 image is unnecessary for the vast majority of items and they hit the computer hard. 8x8 is plenty for a bullet, 64x64 is usually plenty for an item (I'm fairly sure a lot of the weapons and other intricately detailed items are 128x128 however). I can't imagine needing 256^2 for any item or the slowdown being worth it. Items resize themselves automatically on the inventory screen, and they always use the same image. This said, higher resolution for important aspects, such as the player sprites, or plot objects, can give more detail and life to the game world as well as make things possible that weren't originally (a decent melee animation for the captain is a good example of something that's hard to fit in a standard size sheet). Must say that inventory could be bigger. For bigger description panel. Also it would be easier to play on big screen. Or inventory could be scalable. - Engine limitation. This cannot change to my knowledge. For longer descriptions, they must simply go into the Long Description field. Dreamscapes are too lame! - Dreamscapes will not be used in FM. The majority of these suggested changes are also incompatible with the Notrium engine. ... Next version of notrium or something. - Notrium has ceased development and is not open source. As such, engine restrictions are unlikely to be remedied. As Pete said, Driftmoon may expand on these, but I doubt I'll create another FM for Driftmoon until it's ten years old or so. Start of the game where player have steer the escape pod to crash the planet looks rather poor! - Not an issue, there will be no escape pod mini-game. If there is at any point a starship section, which I doubt due to the genre shift involved, then I will revisit appropriate scaling and space graphics. As I say, totally welcome help with graphics, I've only been asking for help in every aspect since I started this thing. Apart from player graphics, I'd be happy to give you a list of potential items to work on. The base items that make up all other items would be good to start with, since these components would be present in every other weapon and gadget in the game. Pete: Look forward to it. The more people who play and have an interest in this thing, the shorter the breaks I take from coding it. Update: You can tell I've finished taking my break on this, since I've already hit another tree related bug. Bizarrely, having a spawner that "turns into" a tree and then sets its genesis bar accordingly causes it to gravitate instantly and irrevocably to the top left corner of the map. This results in a massive wall of trees (all that would be in the area) pouring out of the corner in a long wiggly line of annoyance. I'm about to try dropping an immobile creature that drops a tree and then converts into it, see if that stops them from congealing in a corner, failing that I'm going to have to do something drastic. As promised, a more detailed response. Note that I actually rather like Notrium's art style and consider graphics to be absolutely the least important aspect of a game (I grew up playing Hack, this might also reveal my love of absurd difficulty and trial and error gameplay...), but I will be going in depth into some of the flaws in the original style. [i]I've been watching this thread for some time now. You tnn17 have done great work for this mod. You really have put some effort in making this. Keep up the good work. [/i] - Thanks! [i]Though I dislike your graphical style. [/i] - This is fair, I don't pretend to be a dedicated artist, and let's face it, top-down is hard to do and hard to lift from other sources. [i]It differs too much from the original style. [/i] - Now this, this I don't agree with. The original style, nostalgia aside, has some aspects that simply constrain a mod's artistic freedom if you wanted to stick with them. - Curvy Handled Pistols. I've lost count of the number of mods that have every single gun have an utterly unusable grip because they're constrained to the original pistol. - (IMBWB) A lot of the graphics are created in 3d-imaging software. Without the nostalgia filter, it's pretty easy to spot the internal inconsistency that was already present in Notrium. Compare the laser pistol with the fire extinguisher. There are at least two tiers of graphics which are very different to one another. - The monochrome sprites - The Captain is no longer entirely green. I stand by this change as a pure improvement. - Magical parts. Where does the major component that makes a laser pistol a pistol come from? Where does the metal tip of a welding torch come from? The "pod" in the flamer is a metal cannister that is part of its construction and an item in its own right, it is present in the design for a reason. - Many of the items that aren't manufacturable in Notrium Default are in FM, so the parts to make it need to play a role in its design. Red Plants weren't gatherable, so a non-top down, detailed image of the plant is necessary... So some things simply needed to be changed or added to. - An electrically unfeasible energy coupling. This essentially completes a circuit between one end of the coupling and the other, with no external connection for integration into a power supply or device. That and they're totally a pair of earmuffs. This isn't the only example of something that looks a little wonky in this manner. Better, as you say, to shift over to a new style that's also consistent than to remain with what was already there. Plasma weapons are an example - all of them contain the components of their construction, all of them have the same overall "theme" to their design. All the pistols share the pistol chassis in common. That sort of design consistency spread to all things would be awesome by me. [i]Have to say that your character ragdols are too much anime! [/i] - Apart from not being sure what you consider to be anime, I'm fairly sure I prefer the new ragdolls over the old. Have you looked at the old ragdolls of late? They're inconsistent with one another (Psionic), and they're barely detailed (Android), or they're excessively detailed (Notrium aliens get the most love). So this is completely with the goal of creating a consistent Ragdoll theme: If I bring the android up to a more detailed, imposing image, and the psionic with it, then the Captain suddenly looks pretty bland too. They all needed a facelift. [i]Trees could have shadows! [/i] - Engine limitation. One cannot have a plot object drop in a specific location. The game engine doesn't account for how far into the light oscillation you are either, so the game inherently has no way of keeping track of the time of day. This said, one could do something if they were using my code for a Script Based Day-Night system and ran a little versatile with images. First, they'd need a shadow picture. This would be plot object Shadow 1. This would be a circle (fuzzy border) of near-transparent black situated to the right of the image ([ o]). This would be the dawn shadow. Shadow 2: The Noon shadow ([ o ]), and Shadow 3, the Dusk Shadow ([o ]). Each has a lifespan of 1 ms. Every 1 ms, the shadow dropping entity would drop a shadow of the appropriate type, depending on the time of day. Each entity would need its own distinct code, to drop a shadow plot object that was appropriately sized to match the dropping entity. Any non-periodic plot object would require a duplicate plot object to be created (and dynamically destroyed) alongside it in order to handle the shading. Whilst possible, this is low on my list of possible additions, I don't see it adding much to the game for the amount of work involved, or for the load on a computer that a thousand additional scripts running per second, per entity, entails. [i]Time of day should change more smoothly. Now day turns to nigth in ten seconds or something. [/i] - Planned. When I move onto the new script-based system, day to night will occur over the course of several in-game hours. [i]Color temperature should be matched to day cycle too! Do i need to say more? [/i] - Yes please. I am unaware of any colour outside of Bars, which have unchangeable colour schemes. Is this what you're referring to? [i]Lights at night time would be nice if the shadow would done using umbra and penumbra correctly. Although this reguires some shaders, am i right? [/i] - I'm not sure what you are saying, however light sources never produce shadows in the Notrium engine, and have distinct properties that cannot be readily altered. [i]Higher resolution everything! [/i] - Whilst the Notrium engine can and does handle larger images (all images from the V'E ship to the humble Bullet stick to the same 8x8 multiple rule and are stretched or shrunk accordingly), this is a question of system resources versus necessity. A 1024 x 1024 image is unnecessary for the vast majority of items and they hit the computer hard. 8x8 is plenty for a bullet, 64x64 is usually plenty for an item (I'm fairly sure a lot of the weapons and other intricately detailed items are 128x128 however). I can't imagine needing 256^2 for any item or the slowdown being worth it. Items resize themselves automatically on the inventory screen, and they always use the same image. This said, higher resolution for important aspects, such as the player sprites, or plot objects, can give more detail and life to the game world as well as make things possible that weren't originally (a decent melee animation for the captain is a good example of something that's hard to fit in a standard size sheet). [i]Must say that inventory could be bigger. For bigger description panel. Also it would be easier to play on big screen. Or inventory could be scalable. [/i] - Engine limitation. This cannot change to my knowledge. For longer descriptions, they must simply go into the Long Description field. [i]Dreamscapes are too lame! [/i] - Dreamscapes will not be used in FM. The majority of these suggested changes are also incompatible with the Notrium engine. [i]... Next version of notrium or something. [/i] - Notrium has ceased development and is not open source. As such, engine restrictions are unlikely to be remedied. As Pete said, Driftmoon may expand on these, but I doubt I'll create another FM for Driftmoon until it's ten years old or so. [i]Start of the game where player have steer the escape pod to crash the planet looks rather poor! [/i] - Not an issue, there will be no escape pod mini-game. If there is at any point a starship section, which I doubt due to the genre shift involved, then I will revisit appropriate scaling and space graphics. As I say, totally welcome help with graphics, I've only been asking for help in every aspect since I started this thing. Apart from player graphics, I'd be happy to give you a list of potential items to work on. The base items that make up all other items would be good to start with, since these components would be present in every other weapon and gadget in the game. [b]Pete[/b]: Look forward to it. The more people who play and have an interest in this thing, the shorter the breaks I take from coding it. Update: You can tell I've finished taking my break on this, since I've already hit another tree related bug. Bizarrely, having a spawner that "turns into" a tree and then sets its genesis bar accordingly causes it to gravitate instantly and irrevocably to the top left corner of the map. This results in a massive wall of trees (all that would be in the area) pouring out of the corner in a long wiggly line of annoyance. I'm about to try dropping an immobile creature that drops a tree and then converts into it, see if that stops them from congealing in a corner, failing that I'm going to have to do something drastic. Thank you for the fulfilling answers. Things about the graphical style are just my opinions. Little wonky design is just okay in game like this, I think. Most of the stuff in a scifi game would not work any way. No point in making them super realistic at the cost of visual experience. I dont blame you, if you like it other way. I am not mocking your work. I just wanted to give you different points of view. Basically color temperature is color of the white light. As white light seems to have different color depending on the light source. Sun's colortemp differ's depending on its angle. It could be illustrated in a game with different filters. Read more on wikipedia. I'll check what I can do. Do not expect much at this point yet. Thank you for the fulfilling answers. Things about the graphical style are just my opinions. Little wonky design is just okay in game like this, I think. Most of the stuff in a scifi game would not work any way. No point in making them super realistic at the cost of visual experience. I dont blame you, if you like it other way. I am not mocking your work. I just wanted to give you different points of view. Basically color temperature is color of the white light. As white light seems to have different color depending on the light source. Sun's colortemp differ's depending on its angle. It could be illustrated in a game with different filters. Read more on wikipedia. I'll check what I can do. Do not expect much at this point yet. No worries Prefic, I do appreciate the opinion (and for a lot of it I even agree). "Tone" is awkward to convey through a textual medium, but I'm usually pretty mellow in my old age, so don't worry about offending me (equally, if I cause offense it's probably accidental on my part). If I could I'd definitely have every item made to conform to a single coherent visual style - I try to base most items on actual modern day technology currently, but you'd be surprised how little material there is for "arm mounted plasma cutting torch". If I reach the end of the coding (if I avoid another year long hiatus, which is frankly a little unlikely as I'm due to enter the magical world of parenthood in September, this will probably be some time in early 2014) then I'd probably create every image from scratch with this goal in mind. Ideally someone will beat me to it though. That said, if someday someone gets the urge to make a complete retro texture pack to replace everything in FM then that'd actually be pretty awesome as far as I'm concerned. Ah, so different colours based on time of day? Yeah actually, planned with the new Script-based daylight, the "sun" will change colour at dawn and dusk as per the usual light oscillation, whilst Notrium's standard outdoor colour will be slightly greenish (since Notrium's sky is green, rather than blue). That reminds me, the colour of water on Notrium should probably be green too, but I'm not sure if players would be familiar with the notion, so eh. As for helping out - no worries, whenever's/whatever's convenient for you is great. There's no rush for anything at the moment. Update: Trees.... Sort of done. There're occasional bugs still, but it's at a reasonable enough level that I'm crowd-sourcing it to see if anyone else can think of ironing out any of the problems. I have to bring Fruit Trees up to spec, they'll be using a transparent-er fruit texture that overlays on top of the main canopy, rather than replacing it. This will hopefully mean that the player will be able to pick fruit from the tree, possibly have fruit drop around the tree, and fruit will be removed from the tree during the winter months all independently of the canopy, a much more robust system. No worries Prefic, I do appreciate the opinion (and for a lot of it I even agree). "Tone" is awkward to convey through a textual medium, but I'm usually pretty mellow in my old age, so don't worry about offending me (equally, if I cause offense it's probably accidental on my part). If I could I'd definitely have every item made to conform to a single coherent visual style - I try to base most items on actual modern day technology currently, but you'd be surprised how little material there is for "arm mounted plasma cutting torch". If I reach the end of the coding (if I avoid another year long hiatus, which is frankly a little unlikely as I'm due to enter the magical world of parenthood in September, this will probably be some time in early 2014) then I'd probably create every image from scratch with this goal in mind. Ideally someone will beat me to it though. That said, if someday someone gets the urge to make a complete retro texture pack to replace everything in FM then that'd actually be pretty awesome as far as I'm concerned. Ah, so different colours based on time of day? Yeah actually, planned with the new Script-based daylight, the "sun" will change colour at dawn and dusk as per the usual light oscillation, whilst Notrium's standard outdoor colour will be slightly greenish (since Notrium's sky is green, rather than blue). That reminds me, the colour of water on Notrium should probably be green too, but I'm not sure if players would be familiar with the notion, so eh. As for helping out - no worries, whenever's/whatever's convenient for you is great. There's no rush for anything at the moment. Update: Trees.... Sort of done. There're occasional bugs still, but it's at a reasonable enough level that I'm crowd-sourcing it to see if anyone else can think of ironing out any of the problems. I have to bring Fruit Trees up to spec, they'll be using a transparent-er fruit texture that overlays on top of the main canopy, rather than replacing it. This will hopefully mean that the player will be able to pick fruit from the tree, possibly have fruit drop around the tree, and fruit will be removed from the tree during the winter months all independently of the canopy, a much more robust system. Actually water truly is blue if you see through it (adsorbs red/orange light). Only the reflective parts should mimic the sky colour. Unless you plan to have some mysterious other liquid in place of water. Actually water truly is blue if you see through it (adsorbs red/orange light). Only the reflective parts should mimic the sky colour. Unless you plan to have some mysterious other liquid in place of water. Unless you plan to have some mysterious other liquid in place of water. Oo, colour me educated, then a green sky wouldn't have as large impact as I'd suspected (I'd thought it to be entirely the source of its colour, rather than only part of it). At worst it would be a slightly more turquoise that normal, something I can happily ignore. [quote=postid_404001]Actually water truly is blue if you see through it (adsorbs red/orange light). Only the reflective parts should mimic the sky colour. Unless you plan to have some mysterious other liquid in place of water. [/quote] Oo, colour me educated, then a green sky wouldn't have as large impact as I'd suspected (I'd thought it to be entirely the source of its colour, rather than only part of it). At worst it would be a slightly more turquoise that normal, something I can happily ignore. I've been thinking about the ship wreck looting. I hope you still plan to go more into detail with it because right now it is quite unrealistic and unfair. Especially the bonus. Because why would you not be able to get back to a ship wreck once you have more tools to get what you missed out on the first time? I'm sure there is no one following your steps getting everything you are missing out. And instead put the bonus into separate creatures (just like the boxes in the mining area). They could be engine parts of the ship, partly cracked hull plates, cockpits, etc. So the more delicate engine parts, wiring, energy and computer units will be better protected. Once you've got the welding torch or tools you can break them up (thus actually using these). And taking the ship apart will be animated - it will look even more broken afterwards. This way the looting will take some effort on the players part and he will not miss out on things just because he clicked on a ship without the right equipment - he can always get back to it. This whole process could be explained in the ship description as well (telling you that certain parts might be useful for this and that but you cannot dismantle them without tool xyz). Also the tools could be the ones doing very little damage - allowing you to open up already damaged parts of the ship (but not still in tact ones as they *heal* faster than the tools can damage them - thus no opening). And the welding torch will deal so much more damage that it can also open up the still in tact pieces. Maybe this could also block entrances to ships like your own - so it will keep the player from exploring until he is properly equipped. I've been thinking about the ship wreck looting. I hope you still plan to go more into detail with it because right now it is quite unrealistic and unfair. Especially the bonus. Because why would you not be able to get back to a ship wreck once you have more tools to get what you missed out on the first time? I'm sure there is no one following your steps getting everything you are missing out. My proposal would be this: Keep everything you can get without tools as it is, but without the bonus. (jus grabbin that scrap metal cause nothin's holdin it there anyway) And instead put the bonus into separate creatures (just like the boxes in the mining area). They could be engine parts of the ship, partly cracked hull plates, cockpits, etc. So the more delicate engine parts, wiring, energy and computer units will be better protected. Once you've got the welding torch or tools you can break them up (thus actually using these). And taking the ship apart will be animated - it will look even more broken afterwards. This way the looting will take some effort on the players part and he will not miss out on things just because he clicked on a ship without the right equipment - he can always get back to it. This whole process could be explained in the ship description as well (telling you that certain parts might be useful for this and that but you cannot dismantle them without tool xyz). Also the tools could be the ones doing very little damage - allowing you to open up already damaged parts of the ship (but not still in tact ones as they *heal* faster than the tools can damage them - thus no opening). And the welding torch will deal so much more damage that it can also open up the still in tact pieces. Maybe this could also block entrances to ships like your own - so it will keep the player from exploring until he is properly equipped. As a counterpoint, you are doing your level best to gather everything from the wreck, but without tools, you're forced to cut corners. Bashing in a panel with a rock destroys sensetive circuitry within (no computer chip), you manage to uninstall the warp coil, but doing so without a welding torch caused it to break irreparably (no warp coil). Now you have two hunks of metal instead of two useful technological items. It's not that someone else is taking stuff away, it's that you're in a survival situation and you're gathering together everything you can. Whilst interesting and involved, note that you cannot right-click a creature to loot it, nor can you spawn creatures in specific locations (well, you can with plot objects, but you can't spawn the plot objects in specific locations either). Instead that actually sounds like a good plan for an "enterable" ship, requiring the player to cut through bulkheads and the like to get into the different sections to acquire the parts within is a cool idea, but a ship large enough to enter is going to be rare by necessity (teleport to Area X, Plot Marker Y and back again works with a pair of "teleporters" and quite probably an exit marker to steer clear of collision detection, so unique three plot objects for every single enterable vessel). First: Remove current loot list and scripts. For each wreck there will be two one-time effects. Effect 1: Loot table for non-integrated systems. As there is nothing tool related there, tools will not provide a bonus. Fighters will usually contain items like field rations, broken weapons, bullets, energy couplings (rare), scrap metals, batteries and a few basic survival items from the flight kits. Freighters will contain trade goods, ores, foodstuffs, medical supplies and the like. If anyone has suggestions for useful generic trade goods not already included in the game that might be freighted, I'm all ears. Effect 2: Loot table for integrated systems. These systems include integral parts of the ship - Diodes, Tubing, the Warp Coil or propulsion system, fuel cells and so on. There will be a healthy chance that you won't find any integrated systems that are useable. This will cover all three tool types with incremental bonii (so the android will continue to get the best stuff) under the same logic as my first paragraph - you have enough tools to make an attempt, you will try to scavenge everything with the tools you have available. Sometimes you will fail in the attempt due to not having the best tools. If you don't have any tools you simply won't make the second check, and can come back later. There will continue to be a bonus for ship-type, the newer, better ships will have newer, better loot. With this system, having tools is more important, since in the current system you can still crit-succeed and walk away with a key weapon component, at least on the Battleship wrecks. Until you get at least rudimentary tools, you will not be able to advance to more advanced weaponry, but you can gather simple materials without them and come back later. All fairly awkward, but I should be able to complete this during my other work on 0.32. It occurs to me that not everything the player might scavenge is compatible with modern day (from the in-game perspective) modular technology. These types of one-shot items could flesh out loot tables and provide instant weaponry and other valuable items without short-circuiting the game by being breakable into components to turn into every other high-end weapon. Flight Suit - a basic suit of "armour" wearable by most hominids. Blaster - An energy weapon which operated on self-contained energy cells rather than directly from a power supply (hence needing to reload like a pistol). Chemical-propelled hand gun - A pistol that used archaic chemical propellant rounds rather than magnetic propulsion to fire. Works in electrical interference areas, doesn't if you get it wet. Ether Bottle - A disposable cannister of ether, works the same for most things, but doesn't leave a can behind. I dunno about you but the cans are way more useful than the Ether for me. First Aid Kit - A non-technological field medikit which can't be used for all the awesome medikit uses, but heals a decent amount of health. Bazooka - Launches self-propelled explosive rockets. Disposable batteries - Non rechargable, couldn't use in a coupling. These would return 5 energy or so to a technological power supply and that was it. These and other such items would be "dead ends" so to speak, they couldn't be combined together with anything else, weapons would have ammunition that was solely recoverable from wrecks (and would be as rare as the weapons themselves). They'd be a crutch between homemade sticks and stones and a self-manufactured technological arsenal. If this is of interest, feel free to give some suggestions on what sort of things they might be (or just code a few) and I can add them to the loot tables in the long term. Likewise, if you'd prefer to keep things concise and built around the core items, that's fine too. [quote=postid_399013]Because why would you not be able to get back to a ship wreck once you have more tools to get what you missed out on the first time? I'm sure there is no one following your steps getting everything you are missing out. [/quote] As a counterpoint, you are doing your level best to gather everything from the wreck, but without tools, you're forced to cut corners. Bashing in a panel with a rock destroys sensetive circuitry within (no computer chip), you manage to uninstall the warp coil, but doing so without a welding torch caused it to break irreparably (no warp coil). Now you have two hunks of metal instead of two useful technological items. It's not that someone else is taking stuff away, it's that you're in a survival situation and you're gathering together everything you can. Re: Your Proposal. Whilst interesting and involved, note that you cannot right-click a creature to loot it, nor can you spawn creatures in specific locations (well, you can with plot objects, but you can't spawn the plot objects in specific locations either). Instead that actually sounds like a good plan for an "enterable" ship, requiring the player to cut through bulkheads and the like to get into the different sections to acquire the parts within is a cool idea, but a ship large enough to enter is going to be rare by necessity (teleport to Area X, Plot Marker Y and back again works with a pair of "teleporters" and quite probably an exit marker to steer clear of collision detection, so unique three plot objects for every single enterable vessel). As an alternative, because I'd feel empty inside if I didn't rewrite a major part of the game's loot engine at least once per version: First: Remove current loot list and scripts. For each wreck there will be two one-time effects. Effect 1: Loot table for non-integrated systems. This would be cargo, equipment, the pilot's stash, anything that was not an inherent part of the ship or did not require careful removal. Scrap and any other component that could conceivably be smashed off a crashing ship As there is nothing tool related there, tools will not provide a bonus. Fighters will usually contain items like field rations, broken weapons, bullets, energy couplings (rare), scrap metals, batteries and a few basic survival items from the flight kits. Freighters will contain trade goods, ores, foodstuffs, medical supplies and the like. If anyone has suggestions for useful generic trade goods not already included in the game that might be freighted, I'm all ears. Effect 2: Loot table for integrated systems. These systems include integral parts of the ship - Diodes, Tubing, the Warp Coil or propulsion system, fuel cells and so on. There will be a healthy chance that you won't find any integrated systems that are useable. This will cover all three tool types with incremental bonii (so the android will continue to get the best stuff) under the same logic as my first paragraph - you have enough tools to make an attempt, you will try to scavenge everything with the tools you have available. Sometimes you will fail in the attempt due to not having the best tools. If you don't have any tools you simply won't make the second check, and can come back later. There will continue to be a bonus for ship-type, the newer, better ships will have newer, better loot. With this system, having tools is more important, since in the current system you can still crit-succeed and walk away with a key weapon component, at least on the Battleship wrecks. Until you get at least rudimentary tools, you will not be able to advance to more advanced weaponry, but you can gather simple materials without them and come back later. All fairly awkward, but I should be able to complete this during my other work on 0.32. Thoughts on this? Sidenote: It occurs to me that not everything the player might scavenge is compatible with modern day (from the in-game perspective) modular technology. These types of one-shot items could flesh out loot tables and provide instant weaponry and other valuable items without short-circuiting the game by being breakable into components to turn into every other high-end weapon. For example: Flight Suit - a basic suit of "armour" wearable by most hominids. Blaster - An energy weapon which operated on self-contained energy cells rather than directly from a power supply (hence needing to reload like a pistol). Chemical-propelled hand gun - A pistol that used archaic chemical propellant rounds rather than magnetic propulsion to fire. Works in electrical interference areas, doesn't if you get it wet. Ether Bottle - A disposable cannister of ether, works the same for most things, but doesn't leave a can behind. I dunno about you but the cans are way more useful than the Ether for me. First Aid Kit - A non-technological field medikit which can't be used for all the awesome medikit uses, but heals a decent amount of health. Bazooka - Launches self-propelled explosive rockets. Disposable batteries - Non rechargable, couldn't use in a coupling. These would return 5 energy or so to a technological power supply and that was it. These and other such items would be "dead ends" so to speak, they couldn't be combined together with anything else, weapons would have ammunition that was solely recoverable from wrecks (and would be as rare as the weapons themselves). They'd be a crutch between homemade sticks and stones and a self-manufactured technological arsenal. If this is of interest, feel free to give some suggestions on what sort of things they might be (or just code a few) and I can add them to the loot tables in the long term. Likewise, if you'd prefer to keep things concise and built around the core items, that's fine too. Bashing in a panel with a rock destroys sensetive circuitry within (no computer chip), you manage to uninstall the warp coil, but doing so without a welding torch caused it to break irreparably (no warp coil). I've thought about this as well but then again there really should be places you just can't get to with sticks and stones only. Also you are already literally carrying sticks and stones (pebbles w/e). But you might as well not. In that case you would not be able to destroy as much. In either case it would be great to actually use the items that either damage your loot or get you a nice bonus. So you can have some noticeable control over that instead of a big text box and things popping out. would spawning creatures from right clicking (examining) the ship work? so the weak spots become visible only after you've had a look at it. the alternative two time loot sounds acceptable - and some old technology would be great, especially for that ion storm. chemical propulsion for the win! [quote=postid_405001]Bashing in a panel with a rock destroys sensetive circuitry within (no computer chip), you manage to uninstall the warp coil, but doing so without a welding torch caused it to break irreparably (no warp coil). [/quote]I've thought about this as well but then again there really should be places you just can't get to with sticks and stones only. Also you are already literally carrying sticks and stones (pebbles w/e). But you might as well not. In that case you would not be able to destroy as much. In either case it would be great to actually use the items that either damage your loot or get you a nice bonus. So you can have some noticeable control over that instead of a big text box and things popping out. [quote=postid_405001]Whilst interesting and involved, note that you cannot right-click a creature to loot it, nor can you spawn creatures in specific locations (well, you can with plot objects, but you can't spawn the plot objects in specific locations either). [/quote]well the creatures have to be killed with the tools of course - just like boxes but you can spawn items on player location from the right click (is that like making the player drop something he doesn't have?) would spawning creatures from right clicking (examining) the ship work? so the weak spots become visible only after you've had a look at it. the alternative two time loot sounds acceptable - and some old technology would be great, especially for that ion storm. chemical propulsion for the win! Also one thing with wrecks that I'm not too fond of is how easy they are to save scum it'd be better if the results somehow stayed mostly the same(ie. decide the result on map entry or change it rarely enough that there's enough of a opportunity cost to not bother unless you've had terrible luck with other wrecks). I also like the sound of two time loot. (I would have just suggested making better ships unlootable without tools but this sounds better) Also one thing with wrecks that I'm not too fond of is how easy they are to save scum it'd be better if the results somehow stayed mostly the same(ie. decide the result on map entry or change it rarely enough that there's enough of a opportunity cost to not bother unless you've had terrible luck with other wrecks). In either case it would be great to actually use the items that either damage your loot or get you a nice bonus. So you can have some noticeable control over that instead of a big text box and things popping out. Whilst I prefer, to an extent, abstracting gameplay where possible/necessary (compare dropping food next to a fire to getting a piece of wood in order to make a spit, then spending ten minutes turning it), this idea actually sounds good for Storage Containers themselves (which will be a potential loot object from freighter types). Hitting them has a highish random chance of increasing a bar (meanwhile hitting with tools has a low chance of decreasing it, welding torch a higher chance, cutting torch best chance). If the bar maxes out (which is likely if you tried to punch it open), then anything fragile inside is broken. It's not guaranteed (you could probably luck out with any high damage weapon, or a laser), but over time you should gather considerably better loot by using better gear over brute force. Also one thing with wrecks that I'm not too fond of is how easy they are to save scum it'd be better if the results somehow stayed mostly the same(ie. decide the result on map entry or change it rarely enough that there's enough of a opportunity cost to not bother unless you've had terrible luck with other wrecks). Personally I play without saving. If I die, then it's game over and I start all over again. If players play with saves, then that's fine by me, though it makes it a whole mess easier. And if they savescum to get better loot? That's fine too. FM's a hard game, and if the player needs a helping hand, then savescumming will give them that, and hopefully let them explore more of the gameworld. As they get better, then it will get easier for them, and they'll have to scum less and less, until they're able to function without. Speaking on opportunity costs though, there's about a 100:1 chance of getting a weapon component per wreck. This should require quite a few reloads if you're a dedicated scummer. What items are you scumming after? [quote=postid_404002]In either case it would be great to actually use the items that either damage your loot or get you a nice bonus. So you can have some noticeable control over that instead of a big text box and things popping out. [/quote] Whilst I prefer, to an extent, abstracting gameplay where possible/necessary (compare dropping food next to a fire to getting a piece of wood in order to make a spit, then spending ten minutes turning it), this idea actually sounds good for Storage Containers themselves (which will be a potential loot object from freighter types). Hitting them has a highish random chance of increasing a bar (meanwhile hitting with tools has a low chance of decreasing it, welding torch a higher chance, cutting torch best chance). If the bar maxes out (which is likely if you tried to punch it open), then anything fragile inside is broken. It's not guaranteed (you could probably luck out with any high damage weapon, or a laser), but over time you should gather considerably better loot by using better gear over brute force. [quote=postid_405002]Also one thing with wrecks that I'm not too fond of is how easy they are to save scum it'd be better if the results somehow stayed mostly the same(ie. decide the result on map entry or change it rarely enough that there's enough of a opportunity cost to not bother unless you've had terrible luck with other wrecks). [/quote] Personally I play without saving. If I die, then it's game over and I start all over again. If players play with saves, then that's fine by me, though it makes it a whole mess easier. And if they savescum to get better loot? That's fine too. FM's a hard game, and if the player needs a helping hand, then savescumming will give them that, and hopefully let them explore more of the gameworld. As they get better, then it will get easier for them, and they'll have to scum less and less, until they're able to function without. Speaking on opportunity costs though, there's about a 100:1 chance of getting a weapon component per wreck. This should require quite a few reloads if you're a dedicated scummer. What items are you scumming after? What items are you scumming after? Nothing in particular usually just to get at least 3 items or something that I don't already have. Sometimes I don't bother but it can feel like intentionally crippling myself. Also it's not about needing to do it(I could do just as fine without) just that it's just more optimal and people will usually play in the most optimal way regardless of how fun or sensible it is. [quote=postid_399016]What items are you scumming after? [/quote]Nothing in particular usually just to get at least 3 items or something that I don't already have. Sometimes I don't bother but it can feel like intentionally crippling myself. Also it's not about needing to do it(I could do just as fine without) just that it's just more optimal and people will usually play in the most optimal way regardless of how fun or sensible it is. Also it's not about needing to do it(I could do just as fine without) just that it's just more optimal and people will usually play in the most optimal way regardless of how fun or sensible it is. True, but it's most optimal to use the in-game editor to give yourself a machine pistol and five magazines too. I'm just making the system, I don't feel the need to be a policeman over how people play it. Regular Trees are correctly spawning, and destroying their canopies (and only their canopies, usually) on death. Regular Deciduous Trees are correctly switching from leafy to brown to bare as the season changes. Fruit Trees are dropping fruit, have three distinct canopies and randomly spawns random amounts of collectable fruit on its canopy during Summer and Autumn. I also spent some extra time on their code to make sure if anyone wants to make other fruit trees in the future, then it's just a matter of appending it to the existing code. All Prop trees have been replaced by real, living trees, with slight randomisation on total populations with Starting Drops. Intertwined trees growing next to each other will have a shared canopy of both trees. I think this is cool and rare enough that I'm prepared to let it slide. Keep an eye out for any other bugs with trees in the next version and lemme know so I can root 'em out. [quote=postid_393012]Also it's not about needing to do it(I could do just as fine without) just that it's just more optimal and people will usually play in the most optimal way regardless of how fun or sensible it is. [/quote] True, but it's most optimal to use the in-game editor to give yourself a machine pistol and five magazines too. I'm just making the system, I don't feel the need to be a policeman over how people play it. Speaking of: Trees: Complete. That's right, you read that right. Regular Trees are correctly spawning, and destroying their canopies (and only their canopies, usually) on death. Regular Deciduous Trees are correctly switching from leafy to brown to bare as the season changes. Fruit Trees are dropping fruit, have three distinct canopies and randomly spawns random amounts of collectable fruit on its canopy during Summer and Autumn. I also spent some extra time on their code to make sure if anyone wants to make other fruit trees in the future, then it's just a matter of appending it to the existing code. All Prop trees have been replaced by real, living trees, with slight randomisation on total populations with Starting Drops. Occasionally there's one unavoidable glitch: Intertwined trees growing next to each other will have a shared canopy of both trees. I think this is cool and rare enough that I'm prepared to let it slide. Keep an eye out for any other bugs with trees in the next version and lemme know so I can root 'em out. I am seriously, seriously impressed. :o I am seriously, seriously impressed. Sleep is implemented. It would have been done last night, but it was causing bugs, among other things, in trees. The code behind trees is now even bigger and more robust to avoid these bugs. Staying still will cause the player's Zzz bar to increase. If the Zzz bar is higher than the player's Sleep bar, then they will fall asleep - the less tired you are, the longer it will take to sleep. 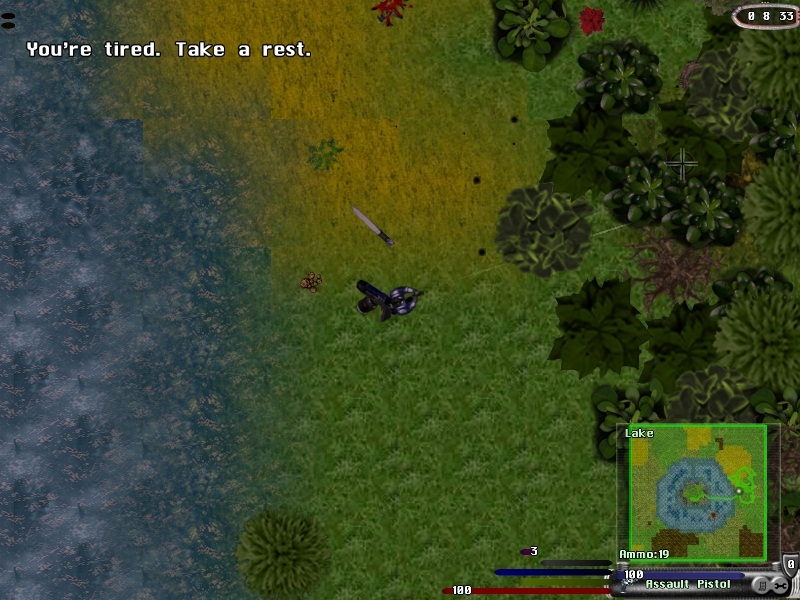 The player can only fall asleep at all if they're less than 75% sleep. Whilst sleeping, time will speed up, the lights will go out (bug #4: Gamespeed makes the "dropping lights" trick break, this avoids it by attaching it to the player like a flashlight), and the player becomes unable to move or shoot. In this state, they recover stamina, health and sleep at an accelerated rate. They're swimming - sometimes, other times you'll start to drown and die horribly, avoid swimming when about to fall asleep? They're thirsty or hungry (though sleeping causes them to lose both slower). If you go without sleep too long, you'll start getting jumpy, have no stamina, and eventually keel over from exhaustion. I'll leave the timing as is at this point, so you can feed back about whether you feel you have to sleep too much or too little, though it will vary race by race. Eventually I'll get round to adding dream scripts, where the player can pick up a race specific set of dreams. I'll probably open the floor to people to be creative at this point. There's also an experimental player involvement here. If the player holds the Right Mouse Button whilst staying still, they will stay awake unless they're incredibly tired, and if the player holds the RMB whilst sleeping, they will eventually force themselves awake. Important to note: Easy mode and the Android require no sleep, so if you want to test it, gotta do it in medium mode. Thanks Narvius. Update: Sleep is implemented. It would have been done last night, but it was causing bugs, among other things, in trees. The code behind trees is now even bigger and more robust to avoid these bugs. Staying still will cause the player's Zzz bar to increase. If the Zzz bar is higher than the player's Sleep bar, then they will fall asleep - the less tired you are, the longer it will take to sleep. The player can only fall asleep at all if they're less than 75% sleep. Whilst sleeping, time will speed up, the lights will go out (bug #4: Gamespeed makes the "dropping lights" trick break, this avoids it by attaching it to the player like a flashlight), and the player becomes unable to move or shoot. In this state, they recover stamina, health and sleep at an accelerated rate. They will automatically wake up if: They're too hot. Too cold. Something hits them. They're swimming - sometimes, other times you'll start to drown and die horribly, avoid swimming when about to fall asleep? They're thirsty or hungry (though sleeping causes them to lose both slower). If you go without sleep too long, you'll start getting jumpy, have no stamina, and eventually keel over from exhaustion. I'll leave the timing as is at this point, so you can feed back about whether you feel you have to sleep too much or too little, though it will vary race by race. Eventually I'll get round to adding dream scripts, where the player can pick up a race specific set of dreams. I'll probably open the floor to people to be creative at this point. There's also an experimental player involvement here. If the player holds the Right Mouse Button whilst staying still, they will stay awake unless they're incredibly tired, and if the player holds the RMB whilst sleeping, they will eventually force themselves awake. Important to note: Easy mode and the Android require no sleep, so if you want to test it, gotta do it in medium mode. Okay, that tears it. I've finally gotten interested in actually trying this thing out. When will we be able to download this fantastic new version with all of these magical features? Okay, that tears it. I've finally gotten interested in actually trying this thing out. When will we be able to download this fantastic new version with all of these magical features? Note that as this was my testing version, you will start out with virtually no Sleep, requiring you to rest soon. It may also be showing a number against Sleep, I can't remember off hand. If sleep deprivation's too much then just fix it in Races.dat. There may be a few other abnormalities from me testing code, so sorry for any mess. If you want to test all the seasonal features, I'd suggest you code up a quick item to skip forward Seasons on use. If you modify the starting stat for seasons, most trees will work, but fruit trees will not spawn outside of Spring, so they won't appear if you start the game abnormally. Update: Poison Arrows implemented, for both the Bow and the Power Bow. I also noticed that the Power Bow was incorrectly pointing at the Bow, meaning there was no difference between the two. This bug has now been resolved, and a small fatigue cost has been added to firing the regular bow. On request, I've also increased the knockback of the hits slightly, with the exception of the explosive arrow and iron arrow. On hit, the poison arrow will poison the target, slow them, and deal damage to them, though it will have minimal effect on green aliens. Here ya go, temporary file: http://www.filedropper.com/fm-031b Note that as this was my testing version, you will start out with virtually no Sleep, requiring you to rest soon. It may also be showing a number against Sleep, I can't remember off hand. If sleep deprivation's too much then just fix it in Races.dat. There may be a few other abnormalities from me testing code, so sorry for any mess. If you want to test all the seasonal features, I'd suggest you code up a quick item to skip forward Seasons on use. If you modify the starting stat for seasons, most trees will work, but fruit trees will not spawn outside of Spring, so they won't appear if you start the game abnormally. Update: Poison Arrows implemented, for both the Bow and the Power Bow. I also noticed that the Power Bow was incorrectly pointing at the Bow, meaning there was no difference between the two. This bug has now been resolved, and a small fatigue cost has been added to firing the regular bow. On request, I've also increased the knockback of the hits slightly, with the exception of the explosive arrow and iron arrow. On hit, the poison arrow will poison the target, slow them, and deal damage to them, though it will have minimal effect on green aliens. sleep bar reached 150 but I could not move and fire and game speed is still accelerated. when sleep bar reached 0 I automaticly fall to sleep again until bar reached to 150 and then I could move. Bars visible is because this is a testing version, those bars let me know which canopy should be showing, whether the tree is failing to combust when it should do, and all that other jazz that's only really important during coding sessions, that's why I disable it. Was the Sleep bar 150, or was it at the maximum of 200? If it's the latter then that's weird. I'll try and chase that one down, thanks. Remember you can wake yourself up by holding the RMB. Particle Accelerators and the Couplings - Both these are supposed to be rare. Particle Accelerators are high tech, fragile gizmos. Energy Couplings are fairly common, but mobile ones that aren't integrated into a ship's systems (namely the ones you can pick up in-game), are highly uncommon. You probably got pretty unlucky with the random loot not to get either. Fortunately when there are technological enemies in the game, there will be far more chances to drop weapons (at least if you can take them out), or weapon components. This will make it far easier to get equipped compared to the current Realism system - where most players will locate equipment to manufacture maybe one particular type of weapon for the whole game. That said, current plans for that are that Marines won't even show up on the planet until you've taken out the Missile Robots, so there'll have to be maybe one or two tech caches to give you a chance with that particular pair of beefgates. Thanks for this. Bars visible is because this is a testing version, those bars let me know which canopy should be showing, whether the tree is failing to combust when it should do, and all that other jazz that's only really important during coding sessions, that's why I disable it. Was the Sleep bar 150, or was it at the maximum of 200? If it's the latter then that's weird. I'll try and chase that one down, thanks. Remember you can wake yourself up by holding the RMB. Particle Accelerators and the Couplings - Both these are supposed to be rare. Particle Accelerators are high tech, fragile gizmos. Energy Couplings are fairly common, but mobile ones that aren't integrated into a ship's systems (namely the ones you can pick up in-game), are highly uncommon. You probably got pretty unlucky with the random loot not to get either. Fortunately when there are technological enemies in the game, there will be far more chances to drop weapons (at least if you can take them out), or weapon components. This will make it far easier to get equipped compared to the current Realism system - where most players will locate equipment to manufacture maybe one particular type of weapon for the whole game. That said, current plans for that are that Marines won't even show up on the planet until you've taken out the Missile Robots, so there'll have to be maybe one or two tech caches to give you a chance with that particular pair of beefgates. i dont remember... i think it was 150 and i didnt know that with RMB tnx. Particle Accelerators and the Couplings - Both these are supposed to be rare. Alright, that's possibly not a bug, though sleep shouldn't have been going down during this time. I'll look into it anyway and try to make sure everything's working as normal. Whoa, harsh. I've never been that unlucky. My last game I ran through I got a particle accelerator from the escape pod, and three energy couplings (I'm a melee nut though, so I never even use them in favour of a Blade). I'll probably make couplings a bit more frequent whilst I'm making the other changes, since so many items count on them (if you don't get a P.A however, you can always get a Diode, a Warp Coil, a simple tazor, a blowtorch, a blade, a bow and arrow or just a freakin' stick). If people start complaining that things are getting too easy (hah) then I'll drop the frequency down again. Update: Warp Drill enabled and combination effects added. [quote]i dont remember... i think it was 150 and i didnt know that with RMB tnx. [/quote] Alright, that's possibly not a bug, though sleep shouldn't have been going down during this time. I'll look into it anyway and try to make sure everything's working as normal. [quote=postid_393029]in 2 hours of playing i searched all ships in ship cementary and i found only 1 energy coupling (i didnt found any particle acc. )[/quote] Whoa, harsh. I've never been that unlucky. My last game I ran through I got a particle accelerator from the escape pod, and three energy couplings (I'm a melee nut though, so I never even use them in favour of a Blade). I'll probably make couplings a bit more frequent whilst I'm making the other changes, since so many items count on them (if you don't get a P.A however, you can always get a Diode, a Warp Coil, a simple tazor, a blowtorch, a blade, a bow and arrow or just a freakin' stick). If people start complaining that things are getting too easy (hah) then I'll drop the frequency down again. Update: Warp Drill enabled and combination effects added. actually i think that since version 0.3, i didnt found any par. acc. Seeds do sometimes splash through the water, good catch. They're invisible and usually move through the water fast enough to avoid the player's notice, but sometimes, especially in the lake, which has so much water so close to the player's starting position and no time for the seeds to fulfil their function, they'll be visible either blinking and stationary (which means it's a tree that couldn't grow because it's in deep water), or they're sparkling across the water, in which case it's either the Area Manager (that handles all spawning in the area), or one of its seeds (which handle the random items and aliens).